Convenient to the airport. Quiet. Walking distance of the Esplanade. range of cafes and restaurants. Stinger net for swimming. 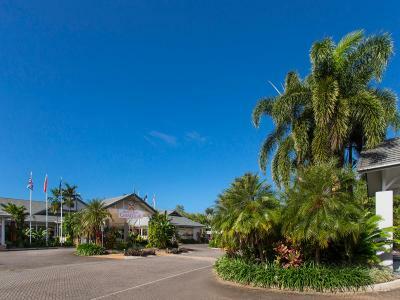 size of the room and location of resort, not on "the strip" in Palm Cove. The location was really nice. Very quiet and only a short walk to the beach. We really liked the pool. The slide was very fun, thank you! Nice location, quiet but near enough to walk to everything. 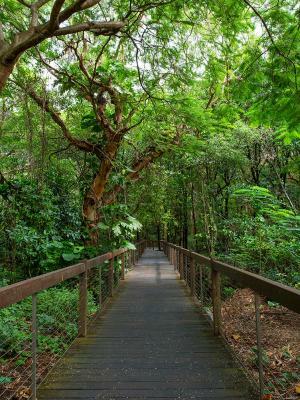 Lovely bush walk to the beach. Had nice meal at the restaurant. It was neat and tidy and the room was comfortable. We have stayed at the property over time & found our rooms most suitable on other occasions. The staff were courteous and most helpful. 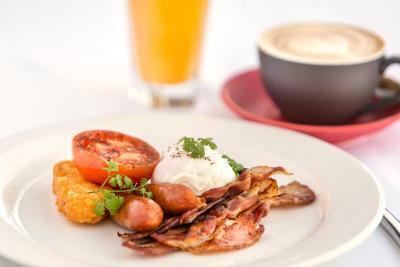 The breakfast is most substantial. Staff at reception were quite friendly . I felt awful having to go to them with some of the issues below, however they were courteous and professional each time. 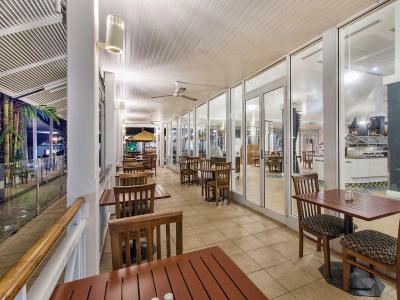 Hotel Grand Chancellor Palm Cove This rating is a reflection of how the property compares to the industry standard when it comes to price, facilities and services available. It's based on a self-evaluation by the property. Use this rating to help choose your stay! 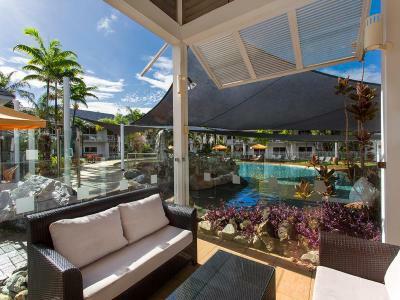 One of our top picks in Palm Cove.In a great location in the lovely village of Palm Cove, which is a gateway to the Far North Queensland's Great Barrier Reef and Daintree Rainforest, the Hotel Grand Chancellor Palm Cove is surrounded by 7.5-acres of lush tropical gardens. 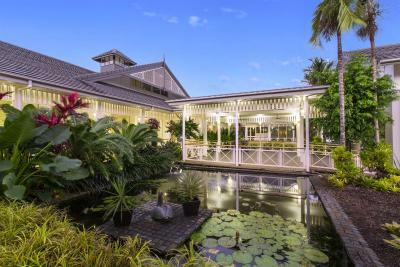 It features an on-site restaurant a bar and 2 swimming pools. The rooms or suites are spacious and contemporary in design and all include an outdoor terrace or balcony that look out over the swimming pools or tropical gardens. The resort also features open-air dining, massage services, beauty and hair salon, as well as a game room. 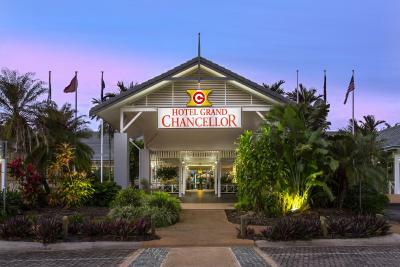 When would you like to stay at Hotel Grand Chancellor Palm Cove? This double room has a balcony or terrace, cable TV and air conditioning. Please note that the price is based on 2 adults and 2 children under 16 years old that use existing beds. 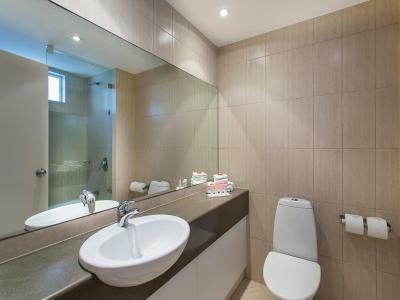 This double room features a balcony or a terrace with views overlooking the garden or pool. This suite has either a balcony or terrace with views overlooking the gardens or pool. This suite features a balcony, air conditioning and cable TV. This suite features either a balcony or terrace overlooking the pool or gardens. 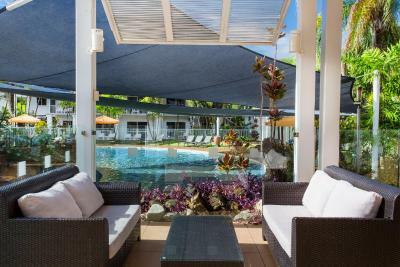 Set on 3 hectares of tropical gardens, this low-rise hotel is 800 meters from Double Island, 2.4 km from Cairns Tropical Zoo and 14 km from Skyrail Rainforest Cableway. 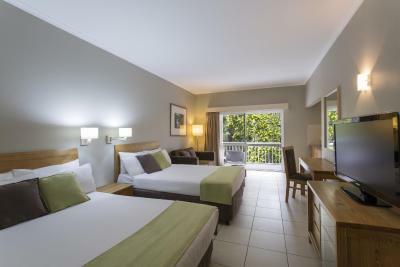 Subdued, minimalist rooms feature en suite bathrooms with soaking tubs and balconies with tropical garden or pool views, plus minifridges, free Wi-Fi and flat-screen TVs. Suites add kitchenettes with microwaves and sitting areas; some have extra bedrooms and bathrooms, as well as mini stereo systems. Room service is available. Amenities include 2 pools, a spa and a beauty salon. There's also a game room, a restaurant and a bar. Parking is free. 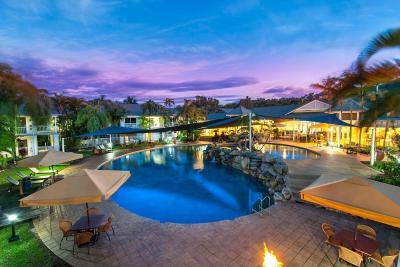 House Rules Hotel Grand Chancellor Palm Cove takes special requests – add in the next step! All children under 16 years are charged AUD 40 per night for extra beds. 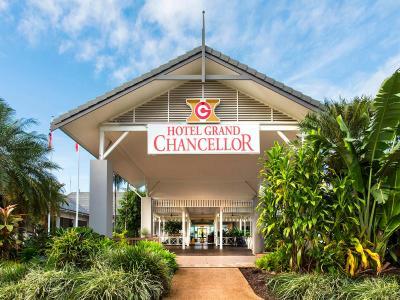 Hotel Grand Chancellor Palm Cove accepts these cards and reserves the right to temporarily hold an amount prior to arrival. Please note that there is a 1.3% charge when you pay with a Visa or Mastercard credit card. Please note that there is a 1.8% charge when you pay with a China Union Pay credit card. Please note that there is a 3.18% charge when you pay with a Diners Club credit card. Please note that there is a 3.37% charge when you pay with an American Express credit card. Please note that there is a 3.57% charge when you pay with a JCB credit card. Please note that the property requires a $100 credit card pre-authorization upon check-in to cover any incidental charges. Relaxing environment. Staff were excellent checkin staff so very helpful. Rooms slent like mould, I was moved twice as tv’s didn’t work. Room need updating and good clean as mould stains on curtains. recently renovated room was wonderful. Pool facility as well was very relaxing. Generally family oriented but was quiet enough to enjoy weekend away with my wife. The only thing that could have been improved was the breakfast. The food and tea and coffee were not particularly hot but otherwise ok. The pool was ideal for families, the room was newly refurbished and the bedding was very comfortable. The pool a bit dirty, such as a shame for a beautiful resort. Didn't realise our room wasn't a part of the main resort. Air con died through the night also. In the bathroom the mirror was very old and needed to be replaced. There was a dead gecko in the cubboard. The room just needed a bit of a facelift. Its starting to look very old and dated. When i tried to call reception from the phone in the room there was no little icons on the phone to indicate to you the area you wished to call. This was stated in the booklet provided in the room. The reception staff were very professional and friendly. I enjoyed the facilities in the compound, the room service was satisfactory. The newly refurbished rooms are sparse, there is no storage for suitcases, no storage in the bathroom (hairdryer was in the bottom of the small closet on top of the safe. Safe was difficult to use at ground level) and limited surfaces to put anything. There was a coffee table and a small area around the television, everything else is on the floor. The fridge was antiquated, not working properly (condensation and icicles) and missing shelves, not a major drama but I had $12 brie! The bar area overlooking the pool has a nice atmosphere, the lounge area in front of reception is nice and relaxed. Pool is very kid friendly, but easily overtaken by a single group if they are so inclined. 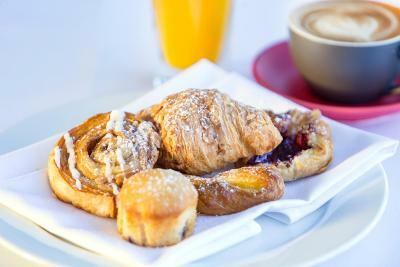 There is lots of variety and good choices for the breakfast menu. I booked a higher grade room for $144 to have breakfast included- was cheaper than paying $25 each at the hotel on top of a super cheap $118 room rate.